Known for their distinctive long necks and spotted patterns, giraffes are one of nature’s most iconic and awe-inspiring wild animals. The discovery of four unique giraffe species now indicates an urgent need for international conservation efforts to save these majestic animals. Over the past three decades, Africa’s giraffe population as a whole has declined by 40% with less than 100,000 individuals remaining in the wild today. Compare that to our worldwide human population which expands by over twice that amount each and every day, and you can begin to understand the scope of the issue. Africa is the second largest and second most populous continent in the world. As is the case almost everywhere humans are found on Earth, rapid human population growth disrupts and displaces the ranges of wild animals, leading to habitat loss. Poaching is also a contributor to a decline in overall giraffe numbers. As a single species, giraffes were classified as “vulnerable” in 2016. However, since giraffes were recently discovered to belong to four genetically and geographically distinct species with nine subspecies, “vulnerable” status does not effectively communicate the dangerously low numbers of giraffe subgroups. Today, the Masai giraffe species (G. tippelskirchi) population has just 32,050 individuals. The southern giraffe (G. giraffe) has just 52,050 including two subspecies: the Angolan giraffe (G. g. angolensis) and the South African giraffe (G. g. giraffe). Some giraffe populations need immediate protection, including the endangeredreticulated giraffe (G. reticulata) with just 8,700 individuals in existence. It is estimated the northern giraffe species (G. camelopardalis) has just 5,195 individuals in the wild, including the West African giraffe (G. c. peralta) subspecies and the critically endangeredKordofan (G. c. antiquorum) and Nubian (G. c. Camelopardalis) subspecies. Now, five wildlife protection groups have filed a lawsuit against the U.S. Fish and Wildlife Service for its failure to list northern giraffes under the Endangered Species Act, arguing that the listing of the northern giraffe species crucial for the subspecies’ survival. Listing northern giraffes would not mandate the habitat protections granted to domestic species, however, it could drastically cut down on poaching by regulating international and interstate imports and exports of giraffe trophies and body parts. Thank you for taking action for giraffes sharing this story and signing up for eNews so you can get the latest updates and actions to help giraffes and other wild animals. Tess killed this giraffe for fun. Tess killed this giraffe for fun. She smiles in front of his dead body and calls it a “dream hunt”! But we NOW have an unprecedented chance to help stop more vulnerable giraffes from being killed — starting by winning them international protection at a crucial wildlife summit in weeks! Sign now and share this with absolutely everyone to get our leaders’ attention! She smiles in front of his dead body and calls it a “dream hunt”! It’s simply unexplainable why someone would be allowed do this. But we NOW have an unprecedented chance to help stop more vulnerable giraffes from being killed. In weeks, countries from across the world are meeting for a crucial global wildlife summit. And for the first time ever, five African countries have proposed to put giraffes onto the list of protected species. This would be a game-changer and wake the world up to give giraffes the protection they deserve. And it’s urgently needed because the giraffe population is already down by 40%. No one should murder animals just for fun, but we have a plan that could finally get giraffes the safety they need. Let’s all sign on now and then let’s make sure we share this with everyone we know! Click here and let’s get giraffes the protection they deserve! She says that, likely knowing that giraffes are highly intelligent, emotional animals — who spend their evenings humming to each other to communicate. It’s time for all of humanity to see our animal friends as possessing rights, and being treated with dignity. So if you disagree that they should be shot for fun, and believe that they should actually be protected from irresponsible game hunts, poaching, and habitat loss — then join us and let’s win them protection at this year’s CITES summit in May, the most important global conference on this issue. This will act as the first step in our Africa-wide giraffe protection plan! So far, giraffes have gotten little attention, but with their population continuously dropping — it’s high time we ring the alarm bells, make this petition go viral, and have our governments act on our behalf! Life on Earth is so precious. And yet, some still think it’s all just a game and it’s the right thing to go and shoot animals for fun. The Avaaz community has stood up together when Cecil the Lion was killed or when Donald Trump tried to re-open the import of animal trophies — let’s do it once again for the giraffes! WARNING: Article contains graphic photo. Oscar-nominated actor James Woods took to Twitter on Monday morning to denounce the practice of trophy hunting, presumably after learning of the controversy surrounding former Idaho Fish and Game Commissioner Blake Fischer. Woods also responded to critics on Twitter who defended conservationists, saying that he was specifically referring to the practice of trophy hunting. “I eat hamburgers. Somebody does the killing. I’m not going to get holier-than-thou about hunters. If you’re a carnivore, then somebody has to do the killing. But killing for a “trophy” is absurd. 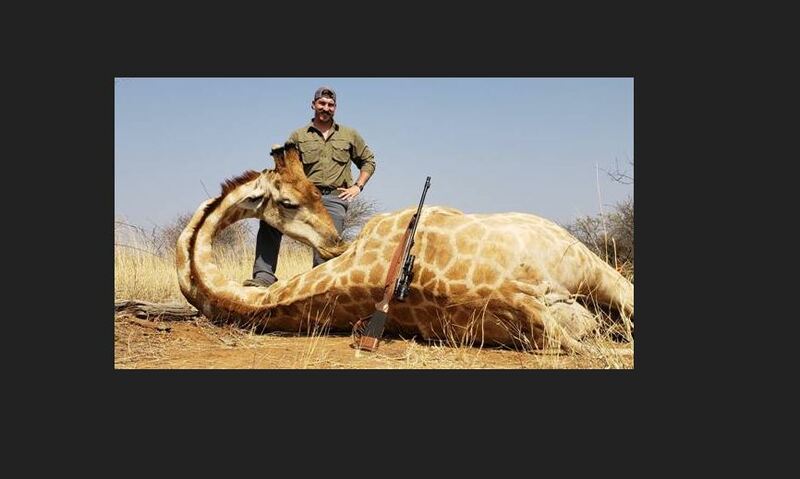 What I’d really like to see is the licensed hunting of poachers,” he tweeted. Woods’ posts came days after news of Fischer’s trip to Africa came to light, along with photos of the animals Fischer and his wife had shot in Namibia, which included a leopard and giraffe, among others. Fischer, who resigned Monday following a request from Idaho Governor Butch Otter, had initially defended his actions, saying nothing he did was “illegal,” “unethical” or “immoral.” He also said he had paid a trophy fee to hunt certain species. Still, his actions were met with criticism from former fish and game officials in Idaho who saw the email, with two calling for his resignation and another requesting an apology for what they called unsportsmanlike hunting practices — especially in regards to the family of baboons. “I’m sure what you did was legal, however, legal does not make it right,” said Frank Trevey, a former Idaho fish and game warden, to Fischer after seeing the email. Fischer apologized to Idaho’s hunters and anglers in a resignation letter obtained by the paper. “I recently made some poor judgments that resulted in sharing photos of a hunt in which I did not display an appropriate level of sportsmanship and respect for the animals I harvested,” he said, in part. Fischer was slated to serve a second term as a fish and game commissioner for Idaho, The Washington Post reported. Fox News’ Edmund DeMarche contributed to this article. That was the feeble excuse made by Blake Fischer, the Idaho Fish & Game commissioner who—like so many others before him—posed grinning and gloating in one morbid photo after another with the animals he’d mindlessly murdered. How many leopards must be reduced to props for these tweaked sportsmen’s arrogant pleasures, before the laws protecting them are brought into at least the 20th century? 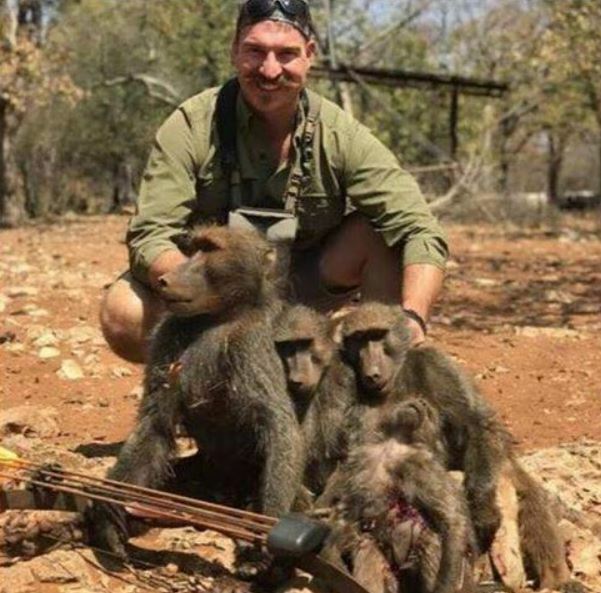 He might not have done anything “illegal,” but impaling to death with arrows and posing alongside an entire family of freshly-killed baboons breaks a lot of taboos, besides being in excessively poor taste for a supposed wildlife official. And although his actions may not currently be “illegal,” who could really blame someone for doing something in response that was? Psychopathic killers should not be placed in charge of threatened, endangered, or other wild animal species. Please call for Blake Fischer to be relieved of his position by contacting the Idaho Department of Fish and Game at 208-334-3700 or posting a comment on the department’s Facebook page. 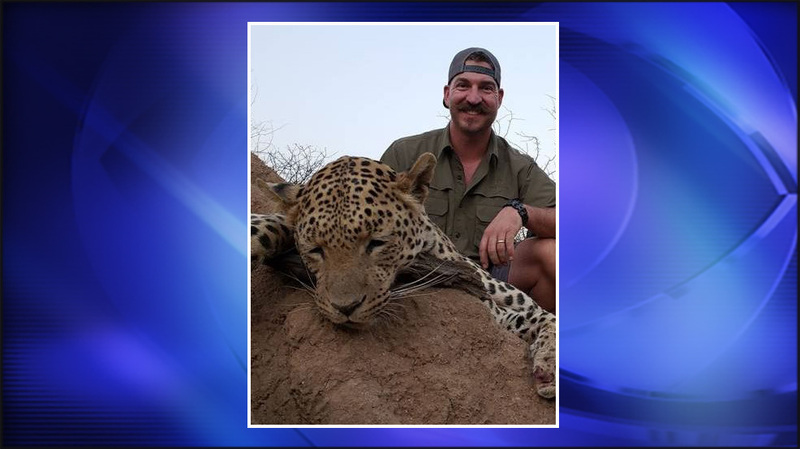 BOISE, Idaho (CBS 2) — An Idaho Fish and Game commissioner who emailed photos of himself posing with a family of baboons he shot and killed during a recent hunting trip in Africa has led to a group of former commissioners asking for his resignation. According to emails and photos obtained by CBS 2 News through Gov. Butch Otter’s office, commissioner Blake Fischer emailed several pictures of his kills to numerous people highlighting his hunting trip. The pictures received swift backlash. He begins the email saying he and his wife had just returned from a two-week hunting trip to Namibia. In addition to the baboon picture, Fischer emailed photos of other animals that he and his wife hunted and killed while in Namibia including a giraffe, leopard, impala, antelope and waterbuck. The photos have garnered the attention of Gov. Butch Otter. The story was first reported by the Idaho Statesman. Former commissioner Fred Trevey, in an email obtained through the governor’s office, said Fischer sent the photos to about 125 people. The Idaho Department of Fish and Game told CBS 2 News that its commissioners are not employees of the department and therefore it has no comment. Two commissioners have declined comment to CBS 2 News, saying all media inquiries for the commissioners need to go through the governor’s office. Steve Alder, executive director for Idaho For Wildlife, a pro-hunting group, said the hunts were despicable and that you shouldn’t exploit animals and stories like this fuel anti-hunting efforts. An American hunter who sparked outrage with photos that show her striking a victorious pose in front of a giraffe she killed in South Africa is hitting back at her critics. While fewer than 100,000 giraffes remain on the continent, the sub-species Talley hunted has seen a 167% increase in population — up about 21,000 — since 1979. Meanwhile, the overall giraffe population has decreased by as much as 40%. Talley also noted the giraffe, about 18 years old and unable to breed, has so far killed three younger bulls able to breed, ultimately curbing the growth of its herd. Trophy hunting is legal in several African countries, including South Africa, Namibia and Zimbabwe. “People will say stuff behind a computer screen they’d never say to your face. 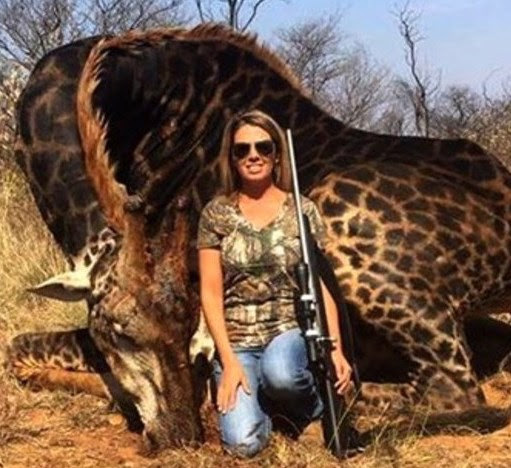 She was hunting in South Africa and giraffes are legal to hunt in South Africa,” Paul Babaz, the president of hunting advocacy group Safari Club International, told CBS. The trophy fee for a giraffe is about $2,000 to $3,000 per animal, with the funds going toward the nearby community. It helps prevent poaching and provides incentive to make sure big game animals don’t become instinct, according to Babaz. “Without that… the poachers will come in and kill the animals indiscriminately, which is very unfortunate,” he said. UVALDE, Tex. 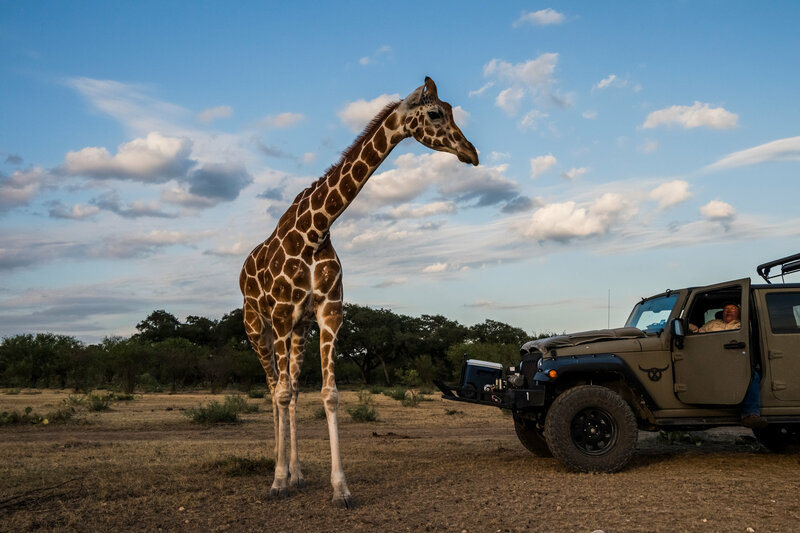 — On a ranch at the southwestern edge of the Texas Hill Country, a hunting guide spotted her cooling off in the shade: an African reticulated giraffe. Such is the curious state of modern Texas ranching, that a giraffe among the oak and the mesquite is an everyday sort of thing. “That’s Buttercup,” said the guide, Buck Watson, 54. In a place of rare creatures, Buttercup is among the rarest; she is off limits to hunters at the Ox Ranch. Not so the African bongo antelope, one of the world’s heaviest and most striking spiral-horned antelopes, which roams the same countryside as Buttercup. The price to kill a bongo at the Ox Ranch is $35,000. Himalayan tahrs, wild goats with a bushy lion-style mane, are far cheaper. 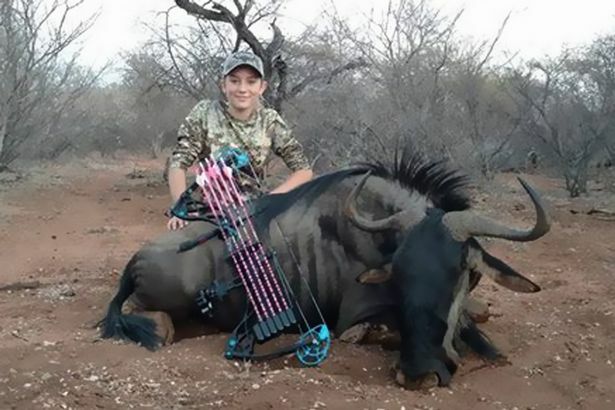 The trophy fee, or kill fee, to shoot one is $7,500. An Arabian oryx is $9,500; a sitatunga antelope, $12,000; and a black wildebeest, $15,000. 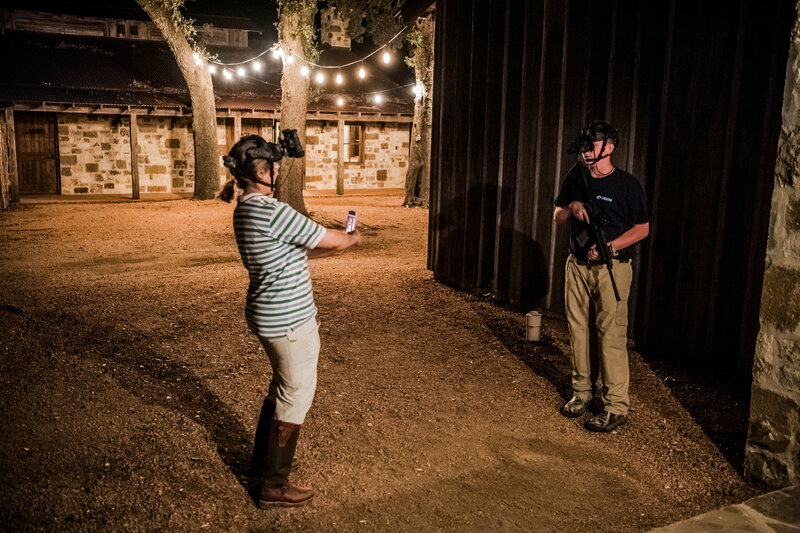 The Ox Ranch near Uvalde, Tex., is not quite a zoo, and not quite an animal shooting range, but something in between. 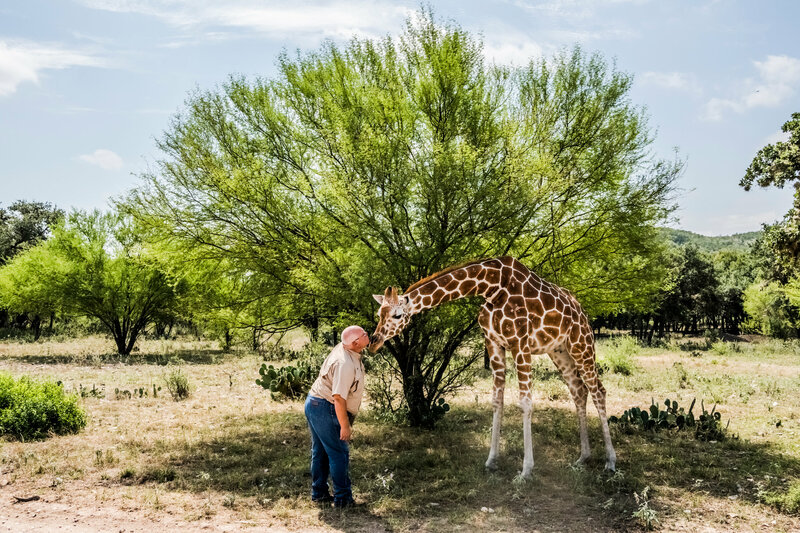 The ranch’s hunting guides and managers walk a thin, controversial line between caring for thousands of rare, threatened and endangered animals and helping to execute them. Some see the ranch as a place for sport and conservation. Some see it as a place for slaughter and hypocrisy. 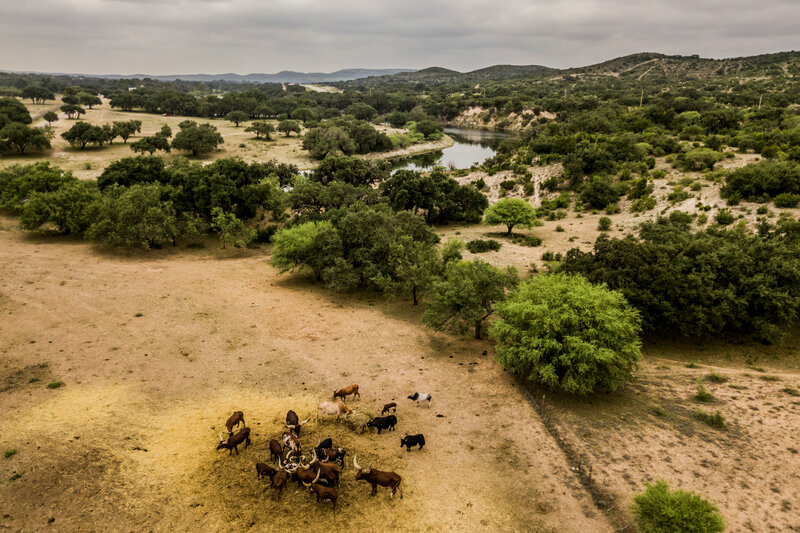 The Ox Ranch provides a glimpse into the future of the mythic Texas range — equal parts exotic game-hunting retreat, upscale outdoor adventure, and breeding and killing ground for exotic species. 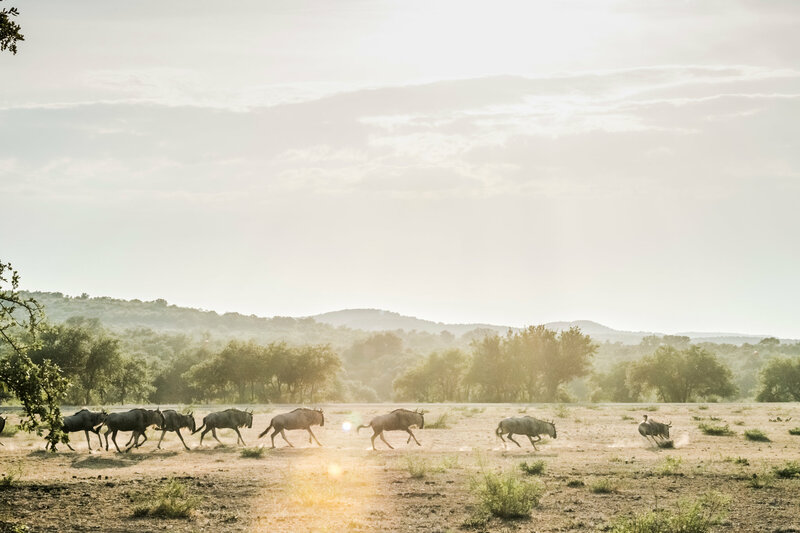 Ranchers in the nation’s top cattle-raising state have been transforming pasture land into something out of an African safari, largely to lure trophy hunters who pay top-dollar kill fees to hunt exotics. Zebra mares forage here near African impala antelopes, and it is easy to forget that downtown San Antonio is only two hours to the east. 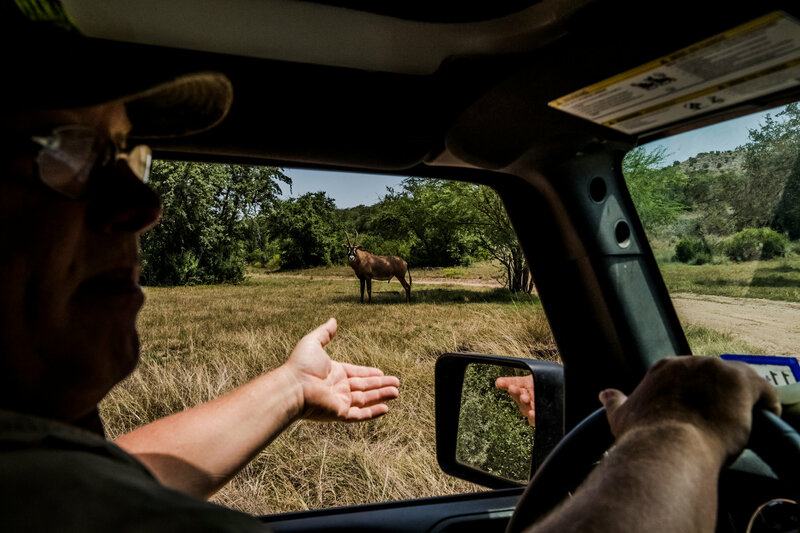 The ranch has about 30 bongo, the African antelopes with a trophy fee of $35,000. Last fall, a hunter shot one. “Taking one paid their feed bill for the entire year, for the rest of them,” said Jason Molitor, the chief executive of the Ox Ranch. To many animal-protection groups, such management of rare and endangered species — breeding some, preventing some from being hunted, while allowing the killing of others — is not only repulsive, but puts hunting ranches in a legal and ethical gray area. “Depending on what facility it is, there’s concern when animals are raised solely for profit purposes,” said Anna Frostic, a senior attorney with the Humane Society of the United States. Hunting advocates disagree and say the breeding and hunting of exotic animals helps ensure species’ survival. Exotic-game ranches see themselves not as an enemy of wildlife conservation but as an ally, arguing that they contribute a percentage of their profits to conservation efforts. Beyond the financial contributions, hunting ranches and their supporters say the blending of commerce and conservation helps save species from extinction. Wildlife experts said there are more blackbuck antelope in Texas than there are in their native India because of the hunting ranches. 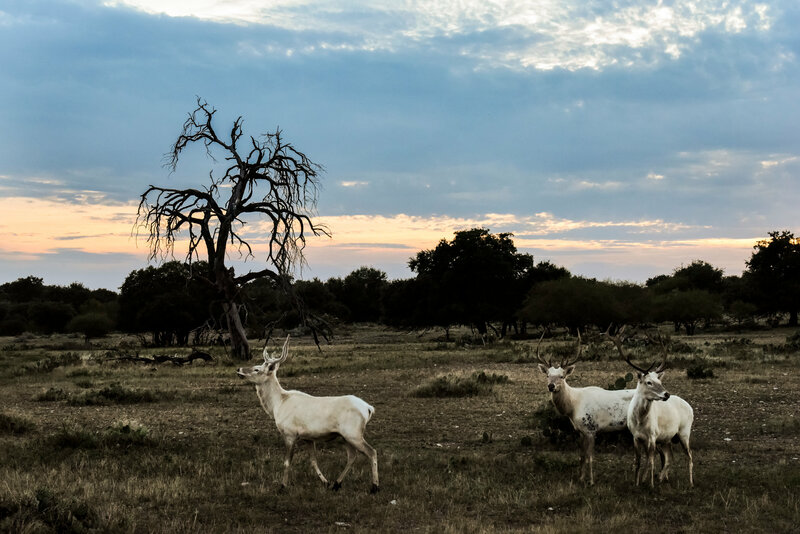 In addition, Texas ranchers have in the past sent exotic animals, including scimitar-horned oryx, back to their home countries to build up wild populations there. 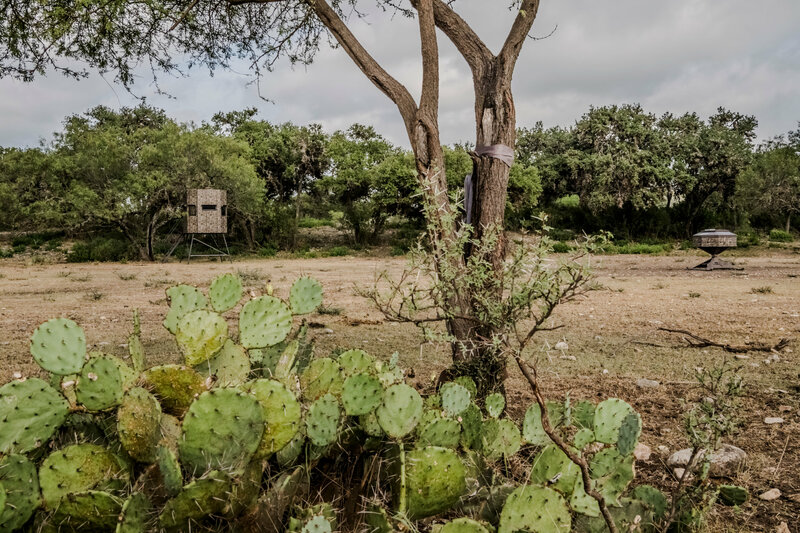 “Ranchers can sell these hunts and enjoy the income, while doing good for the species,” said John M. Tomecek, a wildlife specialist with the Texas A&M AgriLife Extension Service. A 2007 report from Texas A&M University called the exotic wildlife industry in America a billion-dollar industry. At the Ox Ranch, it shows. The ranch has luxury log cabins, a runway for private planes and a 6,000-square-foot lodge with stone fireplaces and vaulted ceilings. 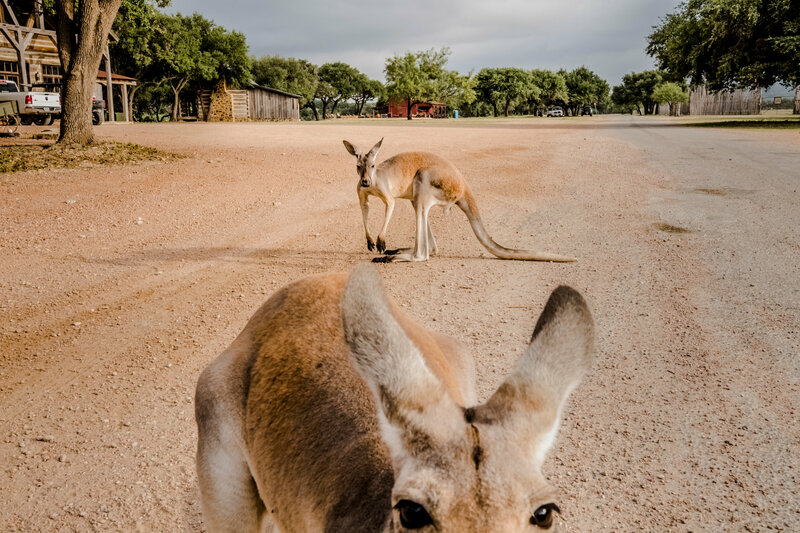 More animals roam its 18,000 acres than roam the Houston Zoo, on a tract of land bigger than the island of Manhattan. The ranch is named for its owner, Brent C. Oxley, 34, the founder of HostGator.com, a web hosting provider that was sold in 2012 for more than $200 million. “The owner hopes in a few years that we can break even,” Mr. Molitor said. Because the industry is largely unregulated, there is no official census of exotic animals in Texas. But ranchers and wildlife experts said that Texas has more exotics than any other state. A survey by the state Parks and Wildlife Department in 1994 put the exotic population at more than 195,000 animals from 87 species, but the industry has grown explosively since then; one estimate by John T. Baccus, a retired Texas State University biologist, puts the current total at roughly 1.3 million. 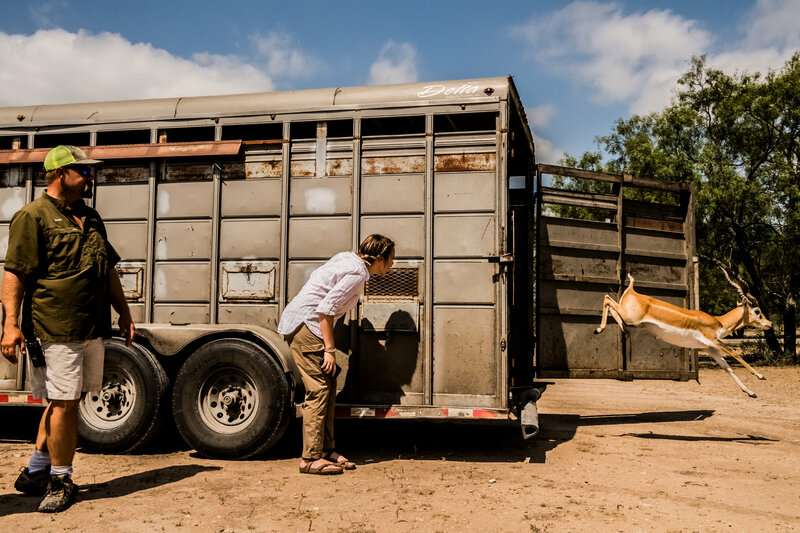 The Ox Ranch needs no local, state or federal permit for most of their exotic animals. State hunting regulations do not apply to exotics, which can be hunted year-round. The Fish and Wildlife Service allows ranches to hunt and kill certain animals that are federally designated as threatened or endangered species, if the ranches take certain steps, including donating 10 percent of their hunting proceeds to conservation programs. The ranches are issued permits to conduct activities that would otherwise be prohibited under the Endangered Species Act if those activities enhance the survival of the species in the wild. Those federal permits make it legal to hunt Eld’s deer and other threatened or endangered species at the Ox Ranch. Mr. Molitor said more government oversight was unnecessary and would drive ranchers out of the business. “I ask people, who do you think is going to manage it better, private organizations or the government?” Mr. Molitor said. Lawyers for conservation and animal-protection groups say that allowing endangered animals to be hunted undermines the Endangered Species Act, and that the ranches’ financial contributions fail to benefit wildlife conservation. The creatures are not the only things at the ranch that are exotic. The tanks are, too. 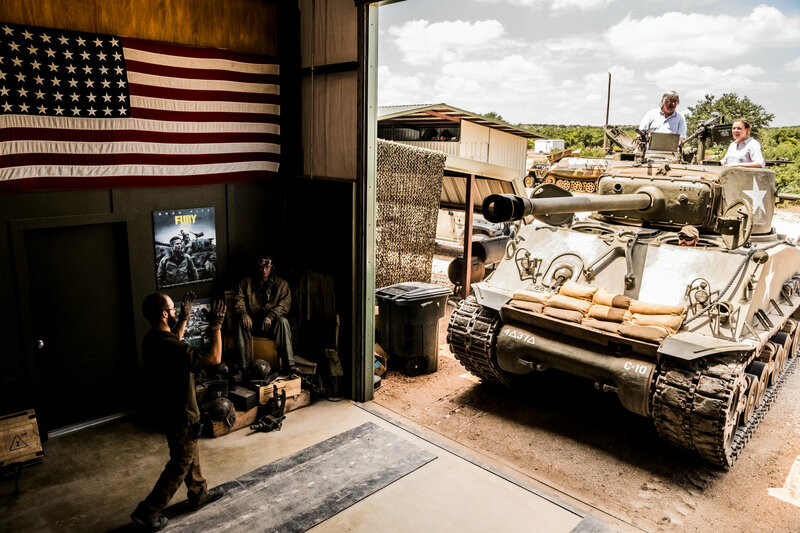 The ranch offers its guests the opportunity to drive and shoot World War II-era tanks. People fire at bullet-ridden cars from atop an American M4 Sherman tank at a shooting range built to resemble a Nazi-occupied French town. Late one evening, two hunters, Joan Schaan and her 15-year-old son, Daniel, rushed to get ready for a nighttime hunt, adjusting the SWAT-style night-vision goggles on their heads. Ms. Schaan is the executive director of a private foundation in Houston. Daniel is a sophomore at St. John’s School, a prestigious private school. 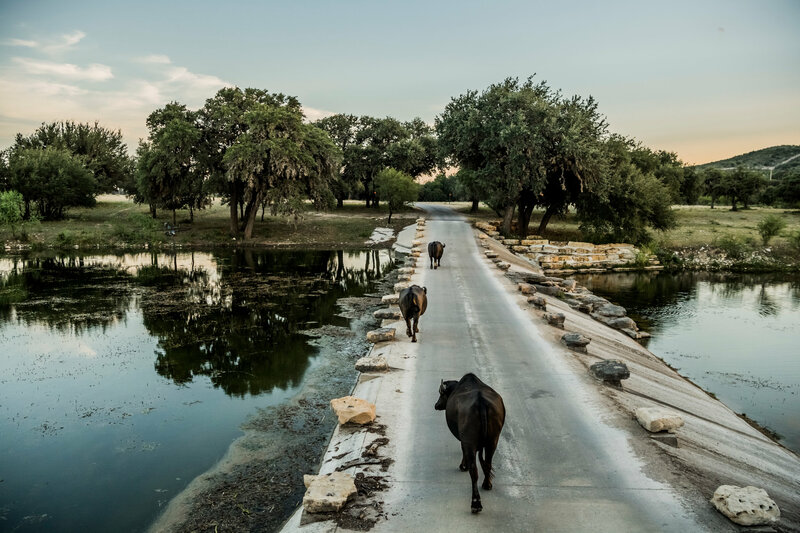 They were there not for the exotics, but basically for the pests: feral hogs, which cause hundreds of millions of dollars in damage annually in Texas. Pursuing the hogs, Ms. Schaan and her son go off-roading through the brush in near-total darkness, with a hunting guide behind the wheel. Aided by their night-vision goggles, they passed by the giraffes before rattling up and down the hilly terrain. Daniel fired at hogs from the passenger seat with a SIG Sauer 516 rifle, his spent shell casings flying into the back seat. Their guide, Larry Hromadka, told Daniel when he could and could not take a shot. No one is allowed to hunt at the ranch without a guide. The guides make sure no one shoots an exotic animal accidentally with a stray bullet, and that no one takes aim at an off-limits creature. One of the hogs Daniel shot twitched and appeared to still be alive, until Mr. Hromadka approached with his light and his gun. Hundreds of animals shot at the ranch have ended up in the cluttered workrooms and showrooms at Graves Taxidermy in Uvalde. 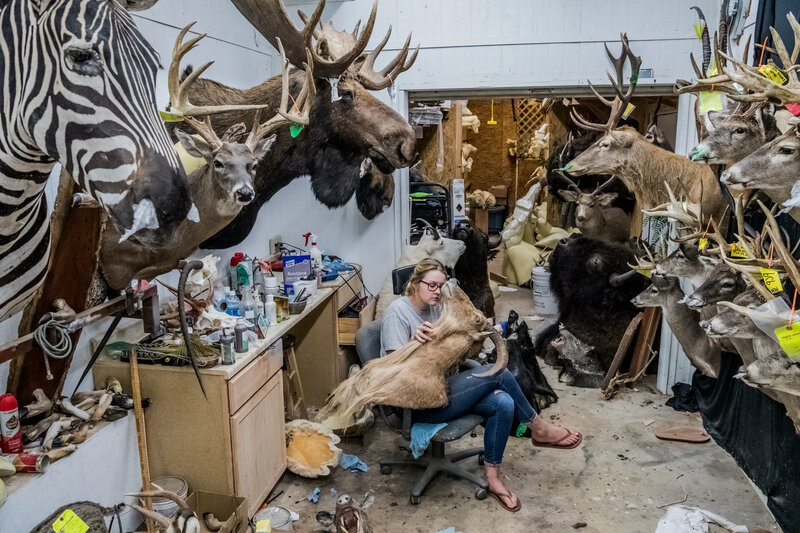 Part of the allure of exotic game-hunting is the so-called trophy at the end — the mounted and lifelike head of the animal that the hunter put down. 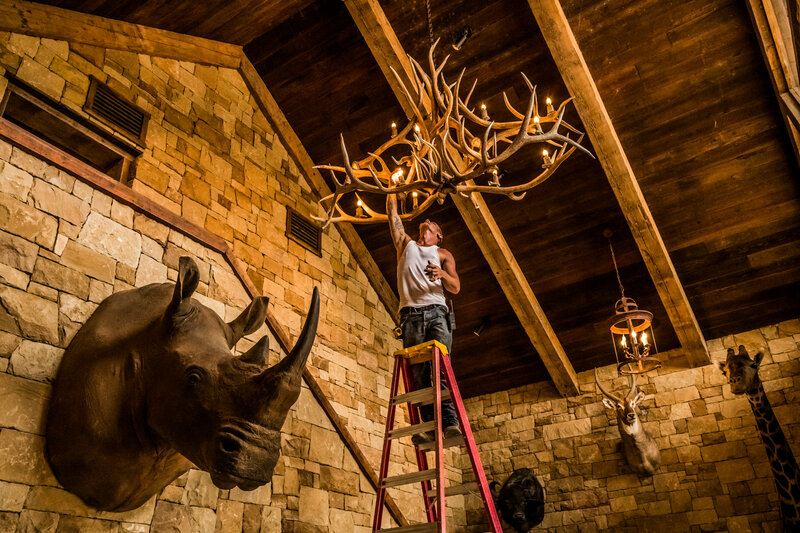 The Ox Ranch is Graves Taxidermy’s biggest customer. 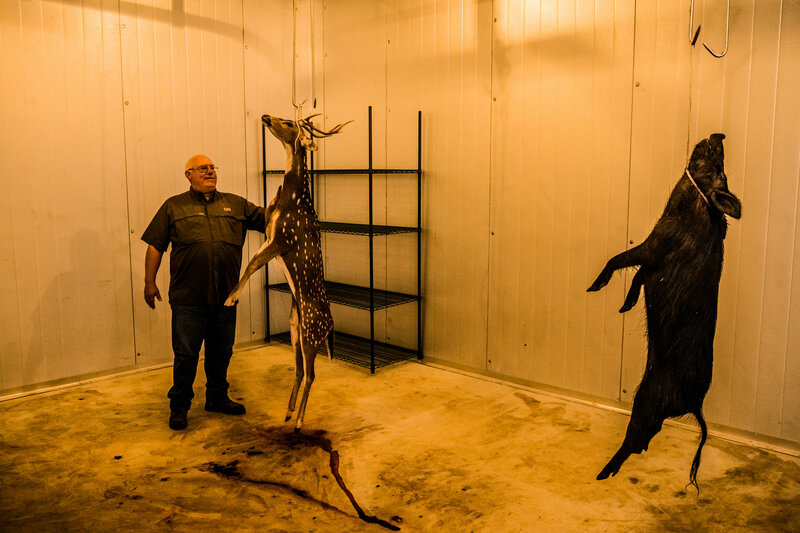 “My main business, of course, is white-tailed deer, but the exotics have kind of taken over,” said Browder Graves, the owner. He said the animal mounts he makes for people were not so much a trophy on a wall as a symbol of the hunter’s memories of the entire experience. He has a mount of a Himalayan tahr he shot in New Zealand that he said he cannot look at without thinking of the time he spent with his son hunting up in the mountains. Small herds passed by the Jeep being driven by Mr. Watson, the hunting guide. There were white elk and eland, impala and Arabian oryx. Then the tour came to an unexpected stop. An Asiatic water buffalo blocked the road, unimpressed by the Jeep. The animal was caked with dried mud, an aging male that lived away from the herd. The buffalo took his time moving. For a moment, at least, he had all the power. If the Fish and Wildlife Service agrees to list the giraffe, a set of legal tools will become available to protect this iconic species. But how would listing in the U.S. help this African mammal, whose population numbers in the wild have dipped below 100,000? More than a century ago, scientists began to notice the disappearance of once prominent species around the world. TheAmerican passenger pigeon, the Carolina parakeet and the Great Auk—once well-established in North America—disappeared. Other species like the American bison and many kinds of whales had once played central roles in important ecosystems but had been reduced to small remnant populations. What would you say to a child who saw a giraffe in a book and asked where giraffes lived? Would you be comfortable saying they’re all gone? A few years later in the United States, the federal government began keeping an official list of species in danger of extinction—what we call endangered species—and species likely to become endangered within the foreseeable future—threatened species. The Endangered Species Act (ESA), passed in 1973, goes further than just identifying imperiled species. Under its terms, listed species are protected from actions “authorized, funded or carried out” by the federal government that may jeopardize their continued existence or adversely affect their essential habitat. Species members are also protected from direct harm by any person. Commerce in species protected by the ESA is generally a crime. The purpose of the ESA is the “conservation” of protected species. In practice, that means bringing the species back to the point where it no longer requires the protection of the ESA. The law’s goal is not to preserve tiny populations on the brink of extinction but to recover species populations that are resilient enough to survive the bad luck which is so often part of living on the planet. Listing is the public, administrative process whereby a species can become entitled to protection under the Endangered Species Act. It centers around one question: Is this creature or plant in danger of extinction? At the listing stage, the federal government can consider only scientific evidence in making its decision. Anyone can initiate the listing process via petition. Evidence suggests the ESA works. A recent report in the Endangered Species Bulletin noted that of the 78 species first listed under the federal precursor to the Endangered Species Act in 1967, only four have been officially declared extinct after half a century. Many others, such as the California condor, the grizzly bear and the whooping crane, have seen remarkable recovery progress. Some, including the bald eagle, have even been removed from the list. There are now 1,382 species of animals listed under the Endangered Species Act as threatened or endangered; 711 live largely within the borders of the United States. For these species, the federal Endangered Species Act can help preserve habitat, require “consultation” on projects that need federal approval and make most hunting illegal. The giraffe, of course, is not native to the United States. How would ESA listing help it? The habitat destruction and overharvesting that threaten the giraffe aren’t happening within U.S. borders. The answer lies in the role the United States plays in buying and selling giraffe parts. According to a U.S. Fish and Wildlife Service database, over the past decade Americans imported more than 21,000 giraffe bone carvings, more than 3,000 skin pieces and 3,744 hunting trophies. If many people want giraffe parts, the demand can be too high for survival of the species. Heightened demand for giraffe products can encourage people to hunt illegally—for example, taking more giraffes than limits allow or hunting in places where it is not permitted. An international treaty, the Convention on International Trade in Endangered Species of Wild Fauna and Flora (1973), known by its acronym, CITES, also addresses this problem. Countries that are party to the treaty meet periodically to list species that are threatened due to international trade. The treaty has two appendices for listing species: Appendix I results in an almost complete ban on commercial international trade; Appendix II requires all international trade in that species be monitored and subject to permits. The giraffe is not currently listed on either of the CITES appendices, but this does not prevent individual countries—such as the United States—from deciding to limit imports. Around the world, markets for species parts are sometimes driven by traditional uses—things like carving ivory or using certain animal parts in traditional medicines. New uses fuel demand too; think of newly wealthy businessmen in Vietnam consuming rhino horn mixed with water or alcohol to show how rich they are. Sometimes, the two can converge: An increase in consumption of shark fin soup has been tied to a traditional celebration dish being served by more people as China’s middle class grew. Listing on the ESA would require the federal government to limit imports of giraffe parts into the United States and would therefore help curtail global demand. The ESA cannot ensure habitat protection or require other countries to take affirmative conservation action to protect the giraffe. But listing in the U.S. would limit one important threat in which Americans do play a role. 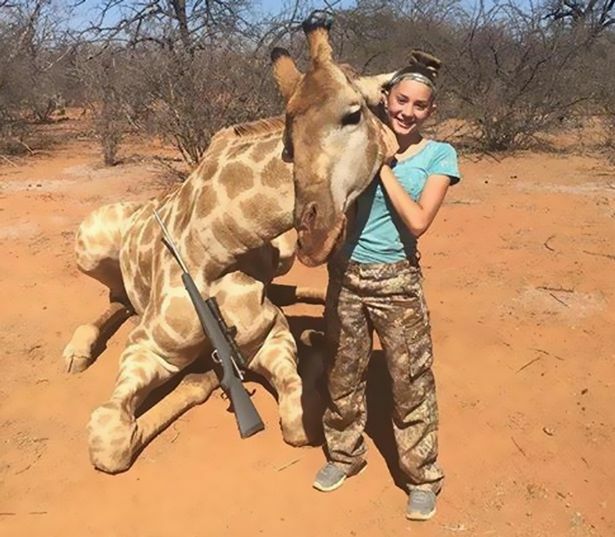 It was the picture which disgusted the world, the grinning face of a 12-year-old girl cuddling the giraffe she had just shot and killed for fun. 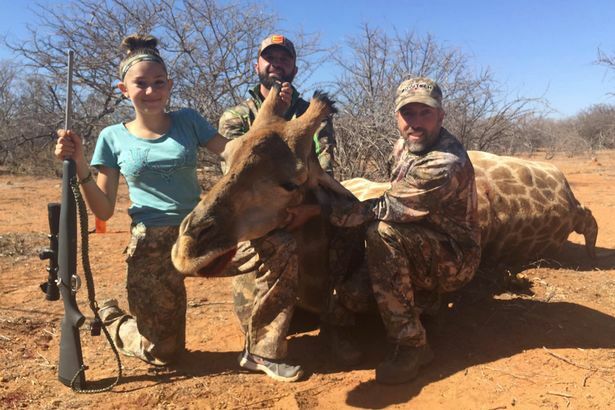 While most her age would be only too pleased to see these creatures running wild, sweet-faced Aryanna Gourdin guns them down for her trophy-hunting album. Our exclusive story sickened animal lovers around the globe, none more so than Sir David Attenborough, who has devoted decades to conservation. The TV legend today calls trophy hunting “incomprehensible”. The father of a 12-year-old big game trophy hunter making headlines around the world is a convicted poacher. Aryanna Gourdin and her father Eli sparked outrage after photos of her rejoicing over the carcass of a giraffe she shot dead were published. He has been accused of “brainwashing” her and using her in a social media campaign to promote their bloodthirsty exploits in the name of conservation. They appeared on ITV’s Good Morning Britain last week wearing “stand up to anti-hunter bullying” after the Mirror highlighted the issue in a front page story. Eli has been convicted of “wanton destruction of protected wildlife” which he was found guilty of in 2010. 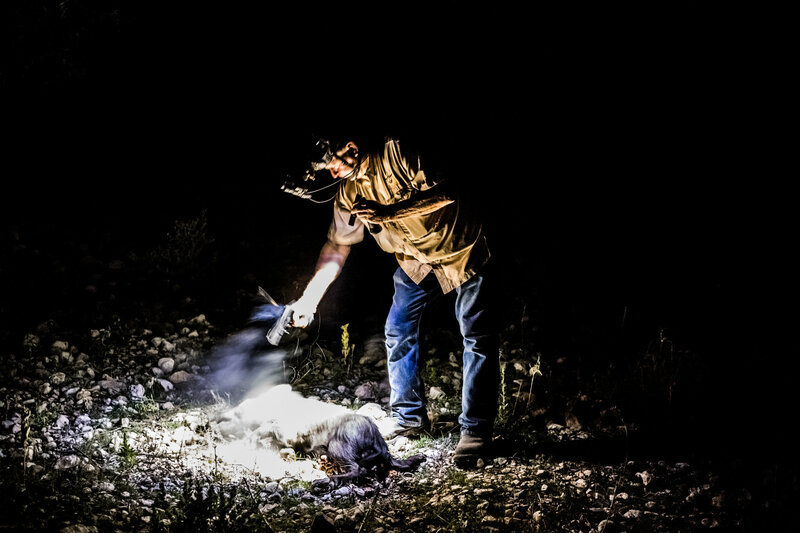 In Utah where they live the crime relates to illegally killing big game such as deer, elk, moose and bison. He also has 15 other convictions related to protected wildlife for which he was jailed in 2000. These include eight counts of transporting and selling protected wildlife. Dr Pieter Kat of the Charity Lion Aid, said: “Despite breaking conservation laws this man has the audacity to loudly proclaim that hunting is conservation.